With its sense of remoteness, big mountain walls and thousands of crags, the Picos de Europa is a climber's paradise. 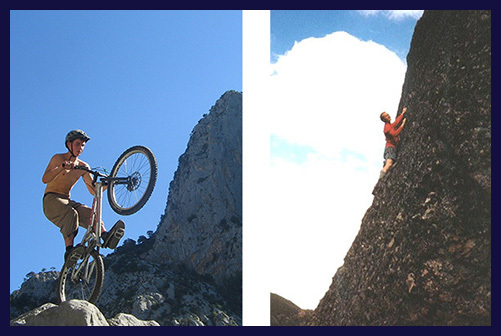 Predominantly composed of karstic limestone, these atmospheric mountains offer a wide range of climbing opportunities. In the central massif, Urriello, aka Naranjo de Bulnes or Picu Urriello (2.519m), is probably the most famous of all the Picos mountains. 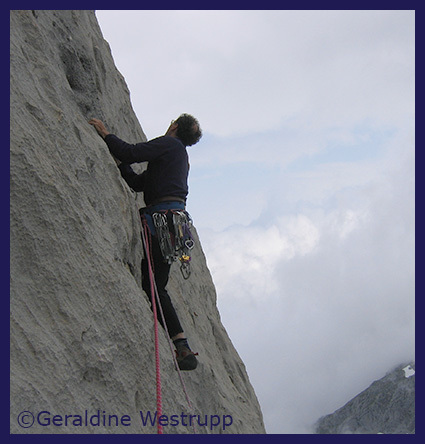 Its west face, in particular, holds an attraction for climbers and mountaineers worldwide. The ninety plus bed hut, or refugio, at its base in the Vega Urriellu provides the perfect starting point for the more than seventy routes, the hardest being on the west face and the easier on the south. 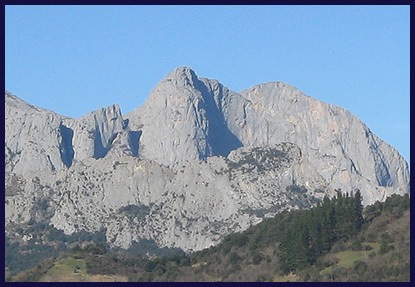 This dominant, thumb-like mountain holds a very special place in Spanish mountaineer's hearts. Other climbs worthy of mention in the central massif (and easily accessed by the teleférico of Fuente De) include the popular Espolón de los Franceses on Peña Vieja, the Agujas de Bustamante and Canalona and the south face of the Torre de los Horcados Rojos. 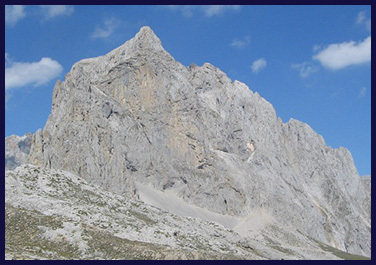 Further west is the longest climb in the Picos on the north ridge/winter gully of Torre del Friero. 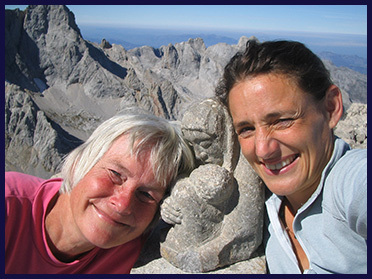 The vast majority of the summits of the Picos de Europa can be gained by anyone with scrambling skills. Winter/spring conditions can often make for easier ascents/descents on forgiving neve snow. 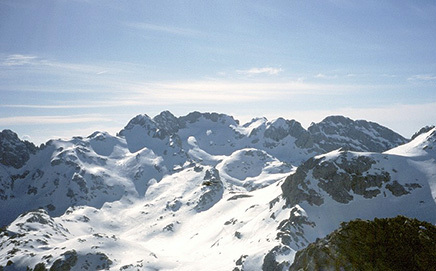 Although situated in the eastern massif, the knife-edged ridge of El Jisu, dominating the view from Potes, is usually accessed through the Collado de Cámara from Aliva in the central massif. It has a classic route of fifteen pitches. The warden of the Cabaña Veronica can supply refreshments along with being in valuable contact with the local mountain rescue group - el GREIM. They provide, at the present, a free service with helicopter. Recommended reading material for routes in the area is Robin Walker's "Walks and Climbs in the Picos de Europa", published by Cicerone Press. Even closer to home, Agero, a valley-based sports crag, has scores of routes of all styles & grades. Topos can be borrowed from us. With its relatively low altitude & south-facing aspect, it's possible to climb in a T-shirt all year round. The excellent friction, applicable to most of the Picos, is reliable even when wet! Try U.K.Crags website for more detailed info. 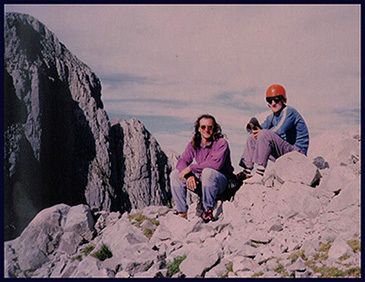 on climbs in the Picos de Europa. "It was gorgeous from the start; rough, prickly, pale grey limestone with adequate, if sparse, protection. 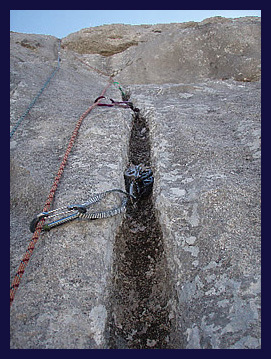 The official crux is the "Crescent Crack" - a beautiful little curving overlap on the fourth of fifth pitch, where I was very grateful for the bolt runner awaiting me as I pulled round onto a steep delicate slab, rather a long distance sideways from Geraldine's belay. That pitch led eventually to a cave belay, whence you traverse quite a long way left into what I considered the true crux. 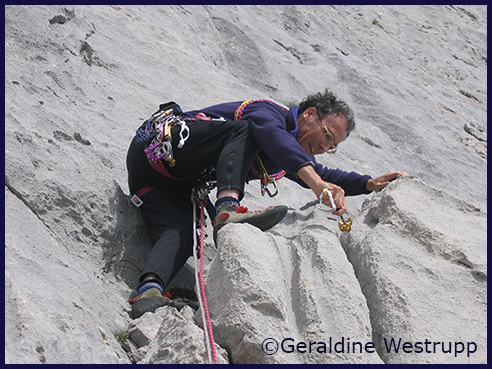 Stephen sums up -"If you like big mountain rock climbs there is masses to do here; big faces, soaring pillars and some impressively airy ridge traverses (not to mention the ski touring in winter). The isolated, beautifully weathered monolith of El Naranjo de Bulnes is undoubtedly the king of the range, offering by far the greatest concentration of big, hard routes, on the best rock; but if you seek solitude, there is a huge wealth of other peaks to explore. Thanks to the efforts of local activists, government plans to turn the Picos into a mechanised theme park bristling with new cable cars have been shelved. For the time being its charm lies in its wildness; long may it remain that way." 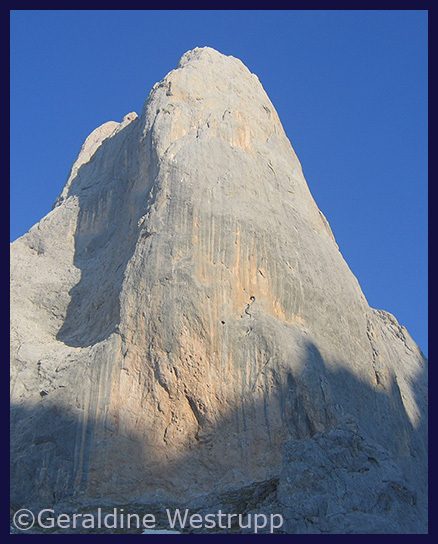 Now available - a downloadable e-book written by a climber for climbers, crammed with info on crags and climbs in the Picos de Europa.This e-book is "...pure information. 27 whole pages of facts about how to get to crags, some of the classic routes and useful information about the areas including accommodation and local amenities."